Dissecting 2016 IPPC’s three pronged theme. Manifestation of the Mimshack anointing on the body of Christ.. The Believers’ LoveWorld International Pastors’ and Partners’ Conference which commenced on Monday 14th November 2016 has entered its third and very critical stage with the opening of the Partners Conference today Wednesday 16th November 2016. The IPPC is not like any other gathering of Christians. It is a special gathering of men and women who have handled the word and are emboldened to use the word to wrought great things. It is a special gathering of stakeholders in the Believers LoveWorld Nation. A gathering of our Ministry’s Pastors and Partners worldwide to receive an uncommon unction from the Holy Spirit. Last year, the theme was Celebrating Greatness, Celebrating Impact, and Celebrating You. It was a great time to celebrate the greatness of God in the lives of citizens of the Believer’s Loveworld nation and the ministry. The impact of the word of God in their lives, and the impact being made all over the world. Interestingly, this year, the theme of the glorious gathering is Celebrating Spreading, Celebrating Impact, and Celebrating You. This is instructive in every sense. It is instructive because it captures the very essence of the prophetic utterance for the year 2016, bringing the Triumphs of the preceding year 2015 to the Spreading of 2016. 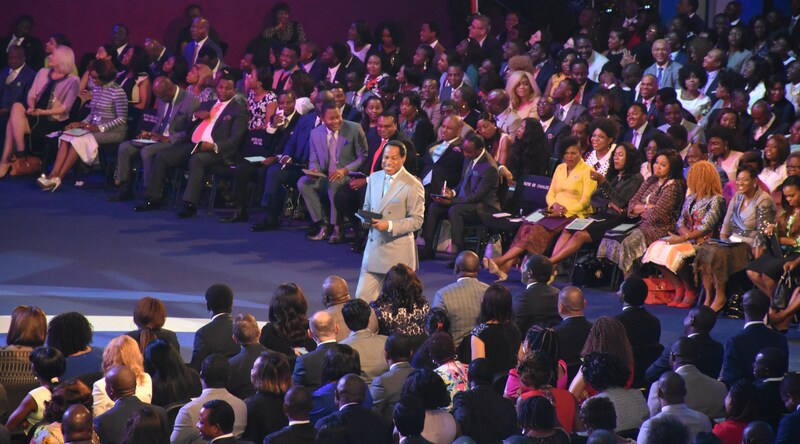 Pastor Chris highlighted that in 2016, there will be three vital areas of spreading to pay attention to so as to get the best result. He identified these three areas as: Spreading in the ministry’s vision, the growth and dominion of the word in the members and all circumstances, and unstoppable increase in all directions. A year later, as men and women gathered at the Loveworld Convocation Arena(LCA) with the report cards of amazing exploits spanning the four corners of the globe. There is no doubt that the prophetic words that came from the Man of God Pastor Chris during the 31st Night Service were not only accomplished, they exceeded expectations. And this can only be by God. From the reports the Secretary General will reel out tonight, it is clear that the vision of the Ministry has spread beyond boundaries and borders. Spread in North America, spread in South America, spread in Europe, spread in Africa, spread in Asia, and spread in Oceania. This indeed is a celebration of spreading, and as Pastor Chris boasted during the 31st Night Service, nothing can by any means stop this spreading. And nothing did. The impact of this spreading has been nothing less than impactful. In every land the Ministry has taken the gospel to, the impact has been total. It has changed nations. Changed understanding, changed perceptions, changed lives. No city where a Christ Embassy Church was established in the last one year has remained the same. Everyone can testify that something truly has happened to them. It is impact. The impact has been both ways. It has impacted nations, societies, and individuals. Those through whom God has used to spread this vision across the world have witnessed inexplicable impacts in their own lives, the lives of those around them, their environs and their societies at large. This gathering is a celebration of the men and women who allowed to be used by the Spirit of God in doing all these amazing works. It is a celebration of ordinary people who the presence of the Holy Spirit in their lives has turned them into extra ordinary people, extraordinary in their homes, extraordinary in their work places, extra ordinary in their environs and extraordinary in their churches. 2016 IPPC is a three in one celebration and one in three celebrations. This year’s IPPC kick started on a very expectant note and delegates are looking forward to a packed, inspiring, Spirit filled schedule till the end of the remaining part of this week. It Is a celebration of the Mimshack anointing; the anointing of spreading. 2016 IPPC is history in making…glorious things are happening here..I can’t wait for 2017. What a ministry! Everything is in order. Thank you Pastor Sir for the opportunity to be here and the glorious impact. Much love from Nungua Ghana.